Leipzig is nicknamed the Heldenstadt (city of heroes). On 4 September 1989, prayers for peace in the Nikolaikirche segued into a Monday demonstration, and a peaceful revolution started which was to sweep the old DDR regime from power in just a matter of weeks, and cause the fall of the "Iron Curtain". So the people of this metropolis in Saxony definitely know a thing or two when it comes to wanting to tear down barriers. And that's why the curators of this year's Leipziger Jazztage came up with the idea that the programme of this, their 42nd edition, should feature the UK, and be placed under the motto "Fish'n'Chips", in honour of the British fast food staple and clichéd national symbol. On 29 March 2019 the United Kingdom is expected to leave the EU – with unforeseeable consequences for cultural practitioners in general and jazz musicians in particular on both sides of the Channel. I could only be there for the last three days of the Leipziger Jazztage, and therefore missed Michael Wollny's Goldberg Tangents experiment. However, the informative programme book does explain the background. The pianist had a double objective with this project to establish a reference to Johann Sebastian Bach's important keyboard work, the Goldberg Variations, written in Leipzig, and also to incorporate the festival’s British theme by doing an experimental collaboration with the electro artist Leafcutter John. I also never got to find out whether the English polymath Matthew Herbert with his Brexit Big Band could find a visionary way to set the forthcoming exit of the UK from the EU to music. And another omission was the panel discussion of journalist/publicist Wolf Kampmann with Matthew Herbert and Rachel Launey from the British Council about the "Brexit Big Bang". These days the events of the Leipziger Jazztage are decentralised. 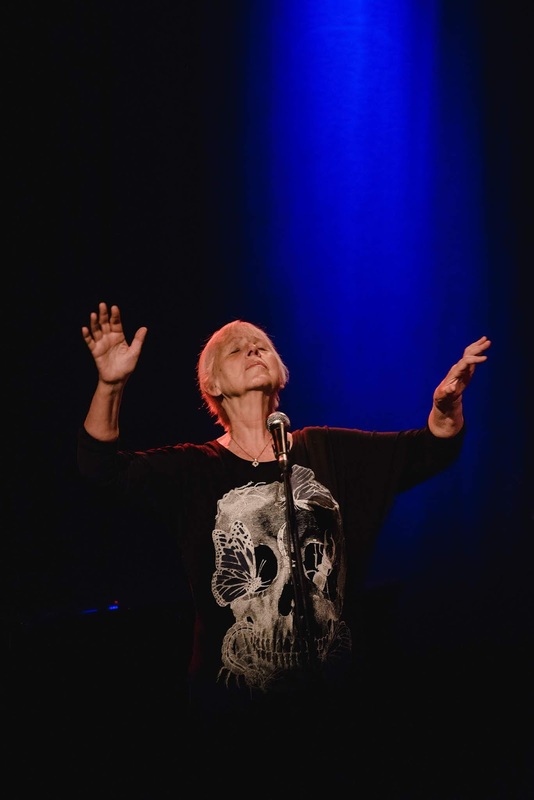 There are concerts in the opera house, aimed at a rather older, "classical" jazz audience, at which the younger audience – and that includes the students of the jazz department of the Hochschule für Musik und Tanz Felix Mendelsohn Bartholdy – are not to be seen. There is the naTo socio-cultural centre, on Leipzig's nightlife mile, the Karl-Liebknecht-Strasse south of the city centre, and that feels closer to the median point, certainly in terms of audience structure’s demographic. But when a concert was announced with the guitarist Helmut "Joe" Sachse, a pioneer of the so-called GDR-Jazz who has just turned 70, with the British vocalist Maggie Nicols, who is the same age, then the audience was full of their age group, notwithstanding the fact that the second part of the evening presented players who could more or less be their grandchildren, Anna-Lena Schnabel (saxophone), Florian Weber (piano), James Banner (bass) and James Maddren (drums). Faced with an onslaught of Sachse's riffs and grooves on semi-acoustic guitar, increasing the intensity even more with loud drone noises, Nicols didn’t seem to have the vocal means on this occasion to offer much of a response. On the penultimate festival evening we went to the Westbad in the district of Lindenau. This indoor venue, opened in 1930 as a public swimming pool, is today an event centre and this year was a festival venue for the Leipziger Jazztage, presenting a newly commissioned composition. The festival organizers had originally tried to persuade the young Berlin percussionist Max Andrzejewski make a homage to the work of David Bowie. But with his quartet HÜTTE, augmented for this Leipzig premiere by keyboard player/guitarist Jörg Hochapfel and vocalist Cansu Tanrikulu, he decided he would prefer to work on Robert Wyatt's songs, with their reputarion for being cryptic. Andrzejewski arranged ten songs and stayed surprisingly close to the originals. Only sporadically did extraneous noises disturb the peculiar pull of the Wyatt songs. The sound pressure and volume, which Wyatt's songs require in order to experience the depth of the different levels of meaning and the streaks between text and music, did prove to be a problem acoustically in the tiled, former indoor swimming pool. It is worth noting that the band which followed this premiere, the quartet/ collective James Farm – Americans Joshua Redman (tenor saxophone), Aaron Parks (piano), and Eric Harland (drums) and US-based New Zealander Matt Penman (bass) – didn’t have these difficulties. These four kept tight, communicated at a high dynamic level, and simply let their improvisational ideas run their course. Harland was also at the drums in the Aziza quartet of bassist Dave Holland, which opened the final evening of the Leipziger Jazztage at the Leipzig Opera. The musical setting of this band was very different from that of James Farm: instead of modern jazz, there were jazz-rock experiments that risked degenerating into cliché. 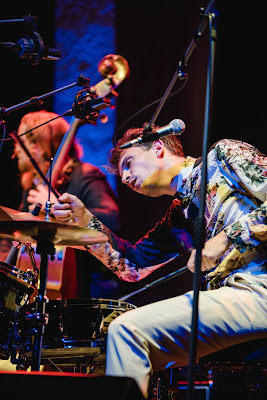 Harland's pressure and powerful drumming was the constant in both bands. But it was only through the interaction with the deep-rooted grooves of the British-born bass player that his rhythmic flow got a further ingredient, and subtly shifted between concrete beat and shimmering pulsation. 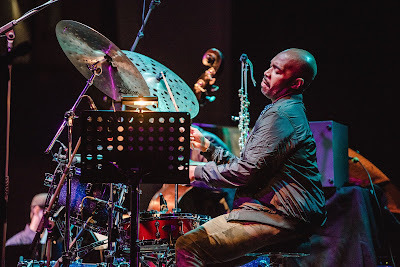 Aziza's jazz rock was also roughened up and contrasted by the single note lines of Lionel Loueke's guitar, which were reminiscent of the music of his homeland Benin, and by the expressive narratives of tenor saxophonist Chris Potter, performed at exhilarating speed. Following this concert, the Leipziger Jazztage seemed to test the borders of audibility in the opera with two quiet sets: first with the deliberately intensive performance of the quartet around the Israeli trumpeter Avishai Cohen, who lives in New York, followed by the concentrated, quiet performance of film music by the English vocalist Norma Winstone and her trio. But it wasn't over yet. From midnight on, there was to be ‘Jazz’ in the Telegraph club in the centre of Leipzig – in fact a revamp of the 40-year old record of that name by Queen, from Berlin guitarist Christian Kögel. With the two tenorists Peter Ehwald and Uli Kempendorff, and with his instrumental colleague and dobro player Kai Brückner and the drummer Rainer Winch, he unpacked the 13 songs on this album. They succeeded in extracting every last ounce of kitsch, opulence and camp out of them that they could. Chapeau! Martin Laurentius is a Contributing Editor at the magazine Jazz thing and works extensively on jazz programmes for German broadcaster WDR 3 and other stations in the ARD network.